What is the Best Mulch for Weed Prevention? 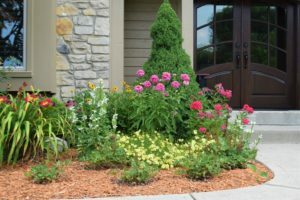 The best mulch for weed prevention will depend on a few considerations: what else you need it to do, where it is laid and of course, what kind of garden or area you are mulching. Mulching is, by definition, covering your soil with a protective layer. Materials vary and can be organic or inorganic, semi-permanent or compostable. Mulch is used to help avoid drought, discourage weeds and retain warmth to keep bulbs and plants warm. However, the focus is really on what it does for the soil beneath. How does mulch prevent weeds? Mulch prevents weeds in a number of different ways. New weed seeds need dirt to grow, and a thick layer of mulch helps prevent the seeds from ever reaching the soil. As for the seeds or roots that are already in the soil, mulch blocks one of a plant’s essential needs, sunlight. Weeds will try to fight their way through, but if your layer of mulch is thick enough, it will suppress all but the most resilient. It’s not always necessary to purchase mulch if you have no aesthetic requirements. Homeowner associations may have requirements to consider, and the whole point of a flower garden is its aesthetics. However, a vegetable garden is different, especially if you’re growing food for the purpose of saving money. The best inexpensive mulch that also benefits your soil includes sawdust or wood chips, compost, grass clippings, leaves, or straw. Be sure to avoid herbicide-treated grass clippings. They will devastate your garden, and the only thing you’re likely to be able to grow will be corn. When using straw, it is best to find bales that don’t have seed heads unless your intention is to grow wheat. Also, try to find organic straw bales. Sometimes wheat is sprayed with a glyphosate herbicide just before harvest and could kill your broadleaf plants. It’s important to remember that grass, leaves, and straw, can contain weed seed, so once they decompose, they add more seeds to the soil. To avoid this, you will regularly need to add more to choke out the light. Rubber mulch does not decompose, so you won’t have to reapply it every year. Also, it is available in a variety of colors making it the most visually appealing option of the nonorganic mulches. The downside is that being nonorganic; it will not decompose and add any nutritional value to the soil. This, however, is easily resolved by using fertilizer. Weed barrier is a nonorganic option that does well at weed suppression, but it is not at all pleasing to the eye. Most gardeners use them in vegetable gardens though they can also be used as a layer underneath other mulch that looks better. This is worth the extra work to some gardeners; others will instead use organic materials that can be left to eventually become more soil. Shredded or chipped bark doesn’t break down as quickly as some other organic mulches. While this means it won’t provide much nutritional value to your soil, it also won’t need to be replenished as often. These mulches come in a variety of woods and colors to match your aesthetic needs. Some favorite woods used for mulch are cypress, pine, cedar or other hardwood by-products available from sawmills in your area. Bark mulches also work well in several different settings but are particularly useful around trees, shrubs and on pathways. The most common mistake people make when applying mulch is not using enough or using too much. To smother the weeds and retain moisture within the soil, the layer of mulch needs to be at least 3 inches thick but no more than 3 inches or you could do damage to tree trunks and shrubs. Even two inches of mulch can let through enough sunlight allowing weed seeds to germinate. Don’t push mulch up against the plants. Keep the mulch at least an inch or two from tree trunks, shrubs and the stems/stalks of your flowers and vegetables. When it’s right up against a plant, it can hold moisture and cause your plant to rot. Since organic mulches break down (and improve your soil), they need to be replenished. You should add an inch of mulch to your gardens either in spring or fall every year to maintain the necessary three inches. Every mulch material has its pros and cons. Straw can harbor insects and weed seeds. Grass clippings can mold and compact. Wood chips and shredded wood require fertilizer to add nitrogen to the soil. Plastic needs to be removed at the end of the season and reapplied the next. What mulch you use will depend on where it’s being used, your budget, if you want to remove it, till it into the soil every year and if you have a preference for organic or nonorganic products. Be sure to research all the pro and cons of each before choosing what will work best for your garden. You can also check out our other articles that go more in depth and are specific to flower gardens and vegetable gardens. Mulch will benefit every area of your garden. Whether you make your own, like grass clippings and leaves, or whether you order in bulk or buy bags of it at McCarty Mulch & Stone, be sure you use MULCH. While your plants and soil will thank you for the benefits of mulch, the weeds won’t!